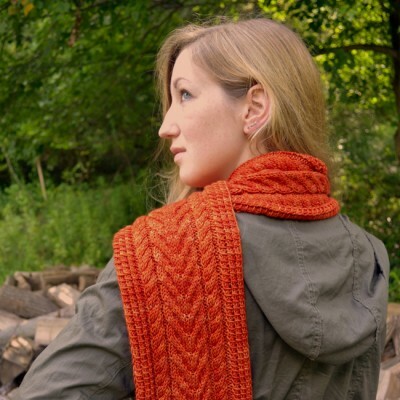 Inspired by an antique cider press, the Cider Press Scarf and Cowl feature a “flowing cider” center cable, “wooden screw” side cables and a “screening” border. 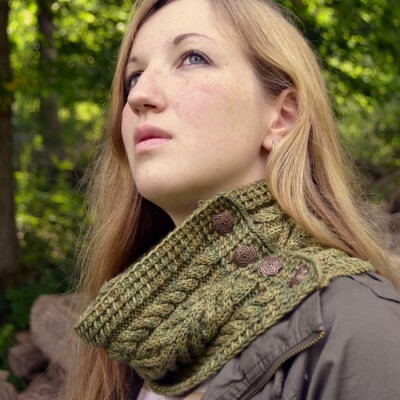 Work Cider Press in a glorious, full length, or the more tailored buttoned cowl…or both! There are many ways to wear this versatile pair as shown in the accompanying photos. 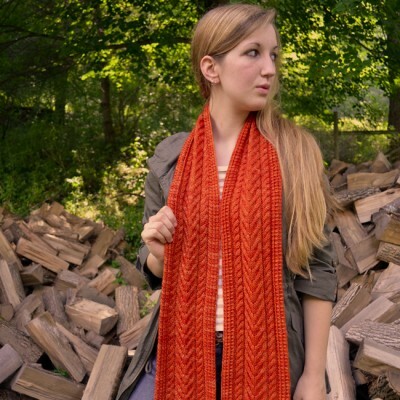 If desired, the pattern can be easily modified for a custom length, while the center of each scarf can also be customized with either an overlapping center (as shown on the orange scarf) or an interlocking center (as shown on the green buttoned cowl). Finished, blocked scarf measures approximately 77” (196 cm) long by 7” (18 cm) wide. Finished, blocked buttoned cowl measures approximately 45.5” (116 cm) long by 7” (18 cm) wide. 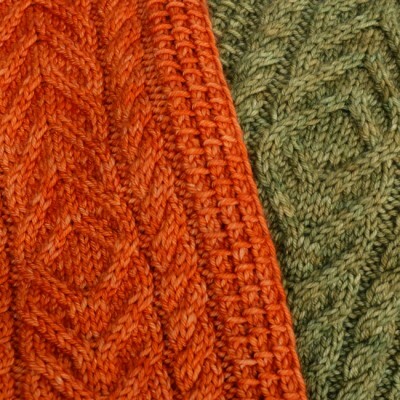 Using larger-sized needles, 30 stitches/26 rows to 4” x 4” (10 cm x 10 cm) in cable pattern, blocked. Gauge is not critical, but keep in mind that a different gauge will result in different finished dimensions as well as changing your yarn requirements. Please make sure you have enough yarn! 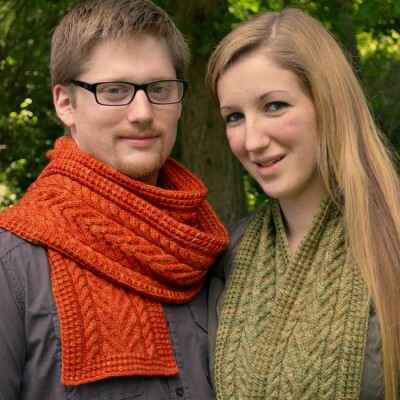 Both the Cider Press scarf and cowl are easily worked from end to end. 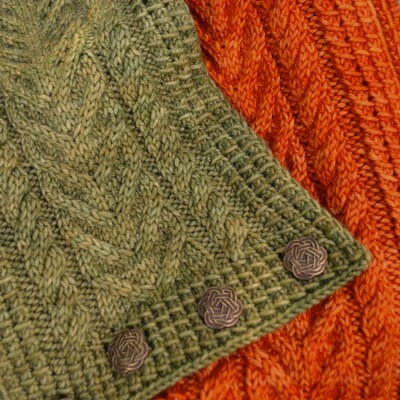 The mirroring effect is achieved entirely by the visual direction of the pattern stitches used. 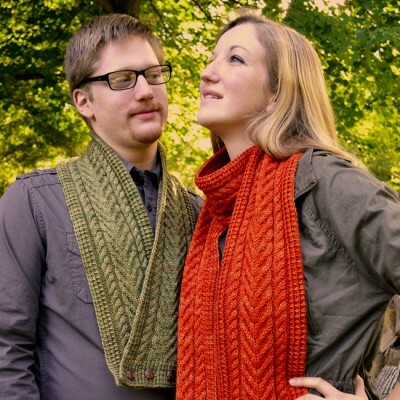 Scarf: Allow approximately 565 yds (517 m) of worsted weight yarn. 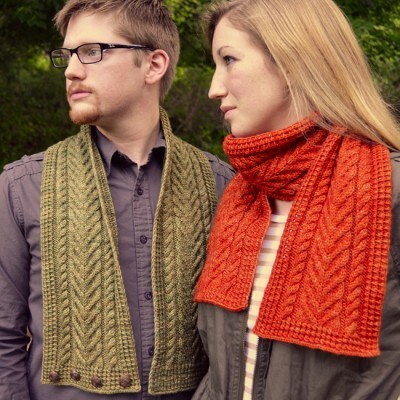 Cowl: Allow approximately 350 yds (320 m) of worsted weight yarn. 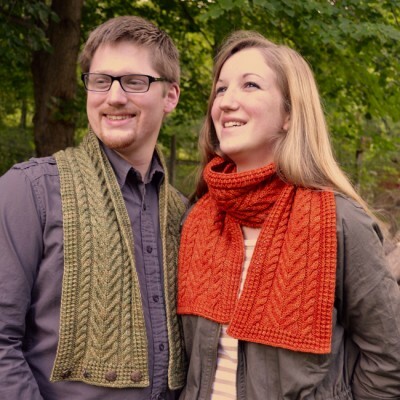 A worsted weight yarn with good stitch definition and little to no halo is recommended. 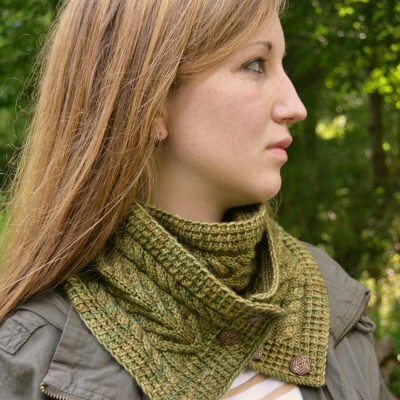 Slight tonals work well, but highly variegated yarn will distract from the cable pattern.